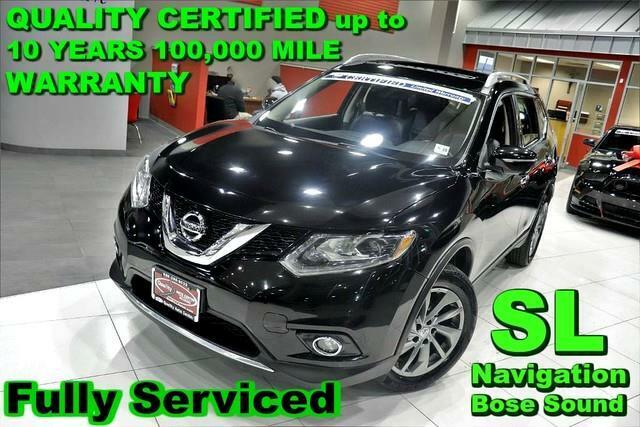 Quality Auto Center is pleased to be currently offering this, 2014 Nissan Rogue SL - Fully Serviced - QUALITY CERTIFIED up to 10 YEARS 100,000 MILE WARRANTY. This Nissan includes: [PRM] SL PREMIUM PACKAGE Lane Departure Warning Rear Parking Aid Generic Sun/Moonroof Sun/Moonroof Blind Spot Monitor Dual Moonroof Headlights-Auto-Leveling SUPER BLACK NissanConnect w/Nav -inc: Bose audio w/9 speakers, 7 color touch-screen display, Nissan voice recognition for navigation and audio, Nav Traffic, NavWeather, SXM TraveLink, Google places and Google send-to-car Note - For third party subscriptions or services, please contact the dealer for more information. * Treat yourself to an SUV that surrounds you with all the comfort and conveniences of a luxury sedan. Start enjoying more time in your new ride and less time at the gas station with this 2014 Nissan Rogue. This vehicle has an added performance bonus: AWD. It improves handling on those winding back roads, and gives you added safety and control when driving through wet and snow weather conditions. This low mileage Nissan Rogue has barely been touched. It's the next best thing to buying new. Knowledge is power and with the complete records of this pre-owned vehicle, you'll have the power to make a wise purchase. Looking for a Nissan Rogue that is in great condition inside and out? Take a look at this beauty. Enjoy the comfort of knowing this Nissan Rogue comes equipped with a manufacturer's warranty. A simple firing of the ignition is all you need to know this awesome machine has speed. The kind that is supercharged with adrenaline. Class defining, one-of-a-kind options are the standard with this Nissan Rogue plus much, much more. Intricately stitched leather and ergonomic design seats are among the details in which test drivers say that Nissan Rogue is in a league of its own Drive any city's streets like you've lived there all your life using the navigation system on this Nissan Rogue. With new tires, this vehicle is ready for miles and miles of driving. Finding a pre-owned vehicle with flawless paint is a rare find, but you've done just that. The paint on this Nissan Rogue SL - Fully Serviced - QUALITY CERTIFIED up to 10 YEARS 100,000 MILE WARRANTY is flawless no scratches, no blemishes, no need to spend extra money on touch ups. This is your chance to own the very rare Nissan Rogue. Upgraded wheel package makes this Nissan Rogue stand out from the rest. More information about the 2014 Nissan Rogue: The Nissan Rogue is a small SUV/Crossover, offering a more car-like driving experience than the more hard-core Nissan Xterra. This puts the Rogue in direct competition with vehicles like the Toyota Rav4 and the Honda CR-V, two vehicles with several generations and years of success under their belts. In order to remain competitive, Nissan has endowed the Rogue with a bevy of features and some very reasonable base prices. The Rogue starts at just under $22,500, while even the top trim model with all-wheel drive can be had for under $30,000. With available three row seating, the Rogue is possibly one of the most versatile vehicles available at such a low price. This model sets itself apart with available all-wheel drive, optional third row seating, Affordable, and high-tech features No Credit / Bad Credit / No Paystubs, No problem !! ! All Approved ! Everyone drives ! CLEAN, GORGEOUS, LOW MILES, SHOWROOM CONDITION. CALL NOW QUALITY CERTIFIED up to 10 YEARS 100,000 MILE WARRANTY , To Certify a vehicle, there will be an additional cost for Certification. CALL NOW For details. STUNNING AGGRESSIVE LOOK ON THIS BEAUTIFUL--Call today to schedule a test drive... Good Credit/Bad Credit/No problem!!!! Get paid cash? No problem!! 100% Credit Approval with interest rates starting at 2.49% for qualified customers, our rates will not be beaten. We price our cars at wholesale price to guarantee the best deals for our customers. Our inventory moves quick, please call to confirm the availability of the vehicle of your interest Springfield location 973-564-0112. This vehicle is located at our SPRINGFIELD location. Come visit our new showroom in Springfield NJ. Quality Auto Center has a wide selection of exceptional pre-owned vehicles to choose from, including this 2014 Nissan Rogue. In their original incarnation, SUVs were chiefly owned by folks who valued utility above sport. Not anymore! The Nissan Rogue SL redefines the SUV and makes the perfect all around family companion. You don't have to sacrifice style or comfort with this fuel-efficient Nissan Rogue. Navigate through all the icky weather with ease in this AWD-equipped Nissan Rogue, and even get non-stop traction for your non-stop lifestyle! In addition to the amazing traction control, you may even qualify for an insurance reduction with this AWD vehicle. The Rogue SL has been lightly driven and there is little to no wear and tear on this vehicle. The care taken on this gently used vehicle is reflective of the 35,473mi put on this Nissan. More information about the 2014 Nissan Rogue: The Nissan Rogue is a small SUV/Crossover, offering a more car-like driving experience than the more hard-core Nissan Xterra. This puts the Rogue in direct competition with vehicles like the Toyota Rav4 and the Honda CR-V, two vehicles with several generations and years of success under their belts. In order to remain competitive, Nissan has endowed the Rogue with a bevy of features and some very reasonable base prices. The Rogue starts at just under $22,500, while even the top trim model with all-wheel drive can be had for under $30,000. With available three row seating, the Rogue is possibly one of the most versatile vehicles available at such a low price. Interesting features of this model are available all-wheel drive, optional third row seating, Affordable, and high-tech features No Credit / Bad Credit / No Paystubs, No problem !! ! All Approved ! Everyone drives ! CLEAN, GORGEOUS, LOW MILES, SHOWROOM CONDITION. CALL NOW QUALITY CERTIFIED up to 10 YEARS 100,000 MILE WARRANTY , To Certify a vehicle, there will be an additional cost for Certification. CALL NOW For details. STUNNING AGGRESSIVE LOOK ON THIS BEAUTIFUL--Call today to schedule a test drive... Good Credit/Bad Credit/No problem!!!! Get paid cash? No problem!! 100% Credit Approval with interest rates starting at 2.49% for qualified customers, our rates will not be beaten. We price our cars at wholesale price to guarantee the best deals for our customers. Our inventory moves quick, please call to confirm the availability of the vehicle of your interest Springfield location 973-564-0112. This vehicle is located at our SPRINGFIELD location. Come visit our new showroom in Springfield NJ.